Recently, we held Vine’s sixth annual egg drop day. This has become a Vine annual tradition since our very first year. Basically, it’s a school party where all of our students, from our Kindergarteners who can barely use scissors through our high schoolers who are driving cars, bring in everyday materials such as cardboard, string, and fabric. With that, they have under an hour to create a simple device that will secure an egg as it tumbles from a height of nine feet. The eggs that succeed are then dropped from our three story window as our students cheer each other on. The first place title goes to the survivor of both drops who had the smallest and lightest device. First, there’s the sheer joy of watching eggs get tossed out of a three story window. On egg drop day, there’s usually a few students, typically some of our middle school boys, who act disinterested before the egg drops begin. When it’s time for eggs to fly, though, everyone is on board, cheering each other on and ecstatic to see what’ll happen. This event embraces the spirit of curiosity and joy of making something out of almost nothing. Spending time turning a cardboard box and everyday materials is a place where true creativity can germinate. In activities like this, you learn to see things from new angles, be resourceful with very basic supplies, experiment with “what if I do this,” and see that you have the power to create an apparatus that can really do something. All of the egg drop devices are so simple, yet so unique. Over the years, I’ve seen a wide spectrum of successes. I've seen an elementary student who struggled each day with reading impress all his peers by creating a simple yet effective device that actually looked like his favorite thing: the Titanic! Another student created a device that looked like a cloud, another like a stroller (to protect the baby egg, of course! ), and another like a beach scene. Still others have demonstrated true engineering thought and ingenuity. Egg drop day is a day where we really embrace our small-school concept and work together as a family. Every student at Vine has a “big” or a “little”: another student he or she is paired up with for many in-school events. During Egg Drop Day, bigs help littles. No one comes out of the event without a device to be thrown from the window because there's always a big kid to help out. Big kids and little kids teach each other! They demonstrate how to think through the problem, carefully show how to use scissors, and even help them keep calm when an idea isn’t coming together as planned. With such dedicated leaders, the little ones are less apt to become over-stimulated or melt into gooey-tantrumy messes. Big kids, on the other hand, get an excuse to play and be kids. Although many of them are at an age where they are “too cool” for group-based school activities, working with their "little" gives them just the excuse to buy into the fun and embrace it. Also, when they help someone else stay positive during a moment of frustration or approach at a problem that arises from a new angle, they are reinforcing these same important lessons for themselves. There is LOTS of failure, and that’s a good thing. At Vine, we embrace the concept of grit and the task of helping our students develop resilience. This doesn’t work without things to fail at. 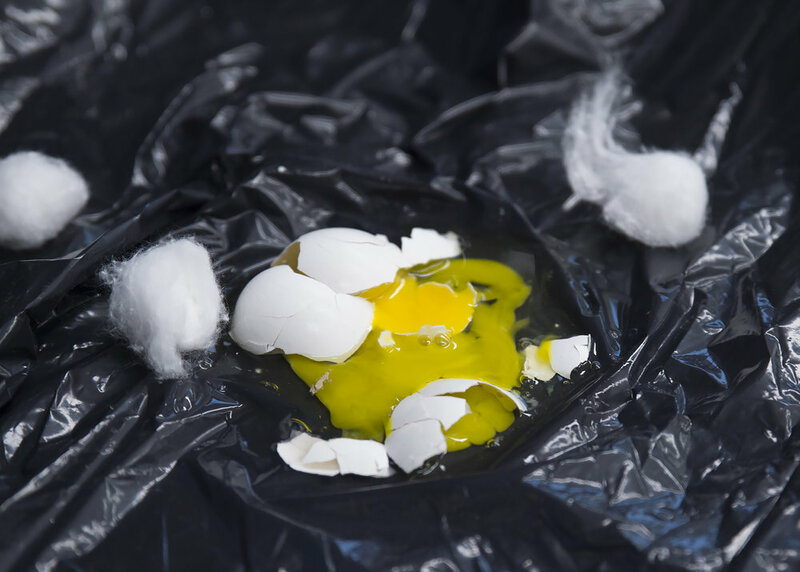 On Egg Drop Day, between 45% and 55% of the eggs won't make it past the first drop. Over the years, I’ve seen amazing designs fail completely while simple, silly designs come out in first place. It’s a fairly level playing field on which anyone can win. In fact, this year, our top two winners were created by a second grader with a very simple design that she spent the majority of her time decorating and a high schooler who put a lot of thought into engineering his design. Ultimately, winning really doesn’t matter: we all get to practice handling failure, being good sports if we do win, and being gracious if our eggs get cracked. It's a place to practice sportsmanship; most of the teaching is passed down not from the lessons we do on sportsmanship before the event but from the "bigs" coaching the "littles" through the event! Ready to see our Egg Drop Day in action?